In the late 1800s, Arab immigrants began to settle on Washington Street in lower Manhattan. Their entrepreneurial spirit transformed the neighborhood, known as Little Syria, into a thriving community with signs written in their native Arabic. Here Arab Americans raised their families, educated their children, built religious institutions and became part of the life of New York. Although razed in the 1940s to make way for the Brooklyn-Battery Tunnel, contributions of the community’s notable residents remain relevant. Among them, world-renowned author/artist Kahlil Gibran, Ameen Rihani, founding father of Arab American literature, and Al-Hoda publishers Naoum and Salloum Mokarzel whose work revolutionized journalism in the Arab World. 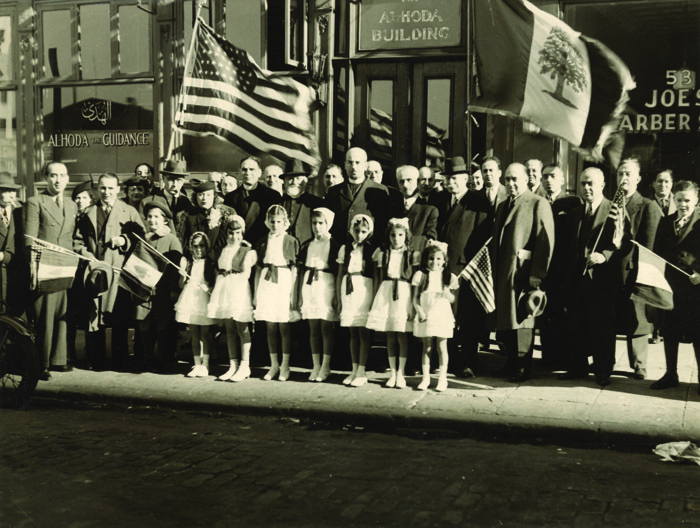 This exhibition documents these stories and more, recognizing Little Syria’s contribution to the great city of New York and providing historical context to some of today’s pressing issues. MCNY will be hosting the exhibit which was researched, developed and produced by the Arab American National Museum and made possible in part by the Ford Foundation and the Arab American Community of New York.